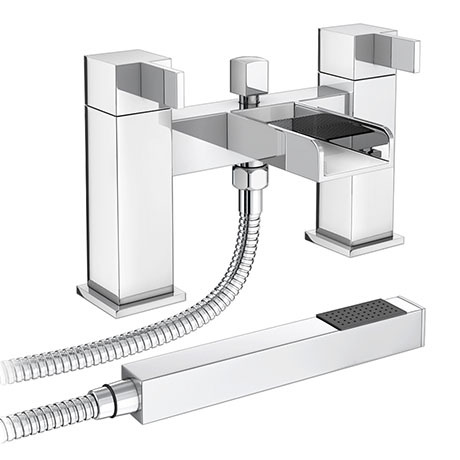 A stylish modern waterfall bath shower mixer with shower kit, part of our range of designer bathroom taps. Features a minimalist square body with matching sleek lever handles and a Waterfall effect open spout. Manufactured from solid brass with a shiny chrome finish. It's contemporary design will bring a touch of sophistication to your bathroom. Includes the handheld shower head, wall bracket and the flexible hose. Q. can you tell me how for the spout protrudes from the body as i would like to fit them on the tile surround, not on the bath. "Look stylish, fit well. Love them."